It is important to understand that the Moon rules the home and the family. It also rules the emotions, feelings, sensitivities and moods, while Saturn rules stability and responsibility. 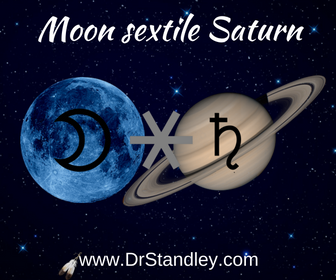 The Moon is emotional, while Saturn is disciplined and cautious. The Moon rules the mother, while the Sun rules the father. This aspect reveals stable emotions. This is just a lovely aspect because it favors the individual personally (in the home) and professionally (outside of the home). The Moon rules what goes on inside of the home, while Saturn rules what goes on outside of the home. Not only is the individual patient, practical and responsible at home, they are the same in their career. This is the perfect balance between ones personal needs along with their duty to others. Read more in my Astrology Aspects eBook - click the graphic below!